Residents and visitors are invited to attend several farm tours and events designed to share information about livestock, grains, and more. Roots of Resilience, Matheson Farms and North Cascade Meats – A Farmers’ Cooperative, present this tour on Saturday, June 24. Visitors can tour a working farm, see yaks and cows, and learn about the holistic approach to livestock grazing and ranch management. North Cascades Meat Producers Cooperative will bring their new mobile processing unit. The morning producer educational program is tailored to livestock producers, agencies, and organizations. Registration is $37, $17 for each additional member of the family or farm, $17 for students. The afternoon consumer tour and program is free. The Bellingham Community Food Co-op, Northwest Agriculture Business Center and others will also be on hand. Space is limited and registration is required. The event runs 8 a.m. to 4 p.m. and is kid friendly. To register, see the Facebook event page or visit http://pnchm.org and click on workshops. Contact info@pnchm.org. Matheson Farms is located at 236 W Smith Road in Bellingham. Roots of Resilience (formerly the Pacific Northwest Center for Holistic Management) is one of the first Savory Institute Hubs in the United States. 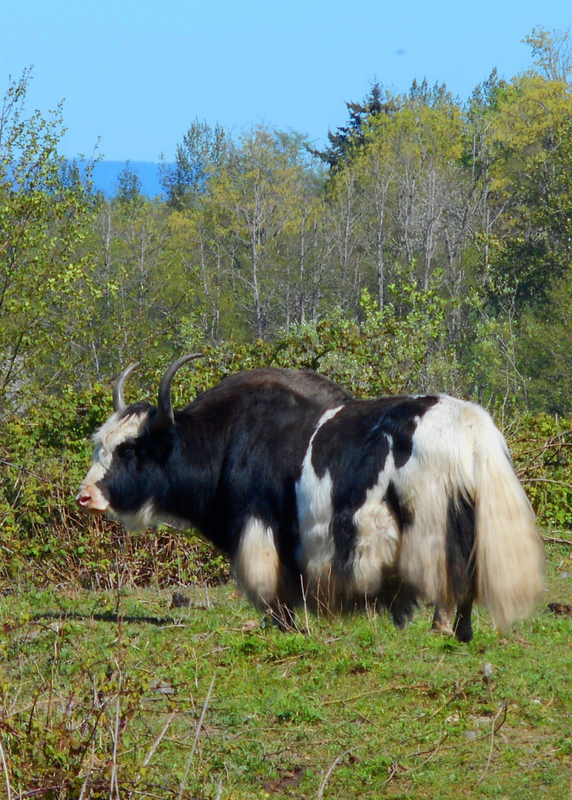 Matheson Farms is a holistically managed grass fed beef operation near Bellingham. North Cascade Meats is a farmers’ cooperative working to fill the processing needs for Whatcom, Skagit, Snohomish and Island County livestock producers. The Livestock Advisor Program is offering this free farm tour at Skagit River Ranch in Sedro-Woolley on Wednesday, June 28. Since 1998, the owners, George and Eiko Vojkovich, farm bio-dynamically to build the soil and nutrient-rich grass that grows healthy animals. They offer beef, pork chicken and eggs, and are USDA Certified Organic and Certified Humane. The tour runs 6-8 p.m. To register, visit farmtours.brownpapertickets.com. For more about Skagit River Ranch, see www.skagitriverranch.com. Anyone interested in learning more about local grains – farmers, millers, bakers, maltsters, distillers, brewers, growers and others – are invited tour the research fields at the WSU Skagit Extension Center on Friday, June 30. Participants can discuss the production of small grains such as wheat, barley, and buckwheat in western Washington for food, feed, and malt. The event runs from 1-3 p.m. and is free and open to all at 16650 State Route 536, Mount Vernon. For more information, check out http://extension.wsu.edu/skagit/. Growing Washington, a Certified Organic 70-acre farm in Everson that grows over 200 varieties of fruits and vegetables each year, welcomes the public for an on-farm tour through Tilth Alliance. This Tilth Farm Walk on July 10 will focus on “Season Extension in High Value Specialty Crops,” showing participants their use of siz greenhouses and over 20 high tunnels. Growing Washington sells through its CSA program of roughly 1,500 members and at 15 farmers markets in the Puget Sound Region. For more information about this event, see www.seattletilth.org under Farm Walks.